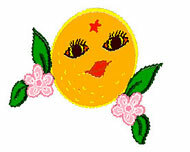 Once upon a time there was a great citrus kingdom on earth, and it was ruled by a wise king, Citrus the Great. The Citrus Kingdom was divided into three large earldoms: Limonia, Orangia, and Mandarinia (Tangerinia). Thousands of peasants laboured on the lemon plantations. The old earl was very proud of his lemon trees, which turned green, flowered, and bore fruit the whole year. You could see buds, and little blossoms, and fruit simultaneously on these amazing trees. The air of the earldom was so permeated with the scent of lemons that even its water smelled of lemons. Burdened with the care of his plantations, the old earl paid very little attention to his son's education, and the youth would vanish for days at a time on hunting expeditions. 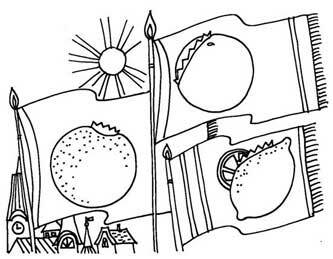 In Orangia, the second largest earldom of the citrus kingdom, the air was hung with a marvellous orange aroma. Orangia brides made white chaplets out of fragrant orange blossoms for their weddings. They were symbols of purity and innocence, and it was obligatory to plant an orange tree by the home of a newlywed bride. In this earldom oranges were the basic food item on the table. Orange citron flesh was added to bread, cottage cheese, milk, and even sour cream. The most exquisite delicacy in Orangia was considered to be orange peel jam. The best cooks in the earldom competed in the preparation of this treat. The people of the earldom, like the people of neighbouring Limonia, never came down sick with anything. The bitter, sweet, and sweet-sour fruit of Orangia drove off all viruses. However, the Earl of Orangia likewise, alas, could not instil love for the orange business in his son and heir. The heir of the ruler of Orangia liked to dance most of all, and he hosted grand balls every day. Once, at a reception in King Citrus's palace, the earl of Limonia made a derogatory comment about oranges. The Earl of Orangia turned as orange in colour as an orange and, in his turn, spoke disapprovingly of lemons. From that moment the earls no longer talked to one another and they issued decrees forbidding their peoples to use any other citrus products in their food except lemons in Limonia and oranges in Orangia. The smallest earldom in the citrus kingdom was Tangerinia. Tangerines grew everywhere there - in orchards, on the streets, and even on the roofs of the houses. Their orange flashlights put the residents of Tangerinia in a festive mood. The Earl of Tangerinia, although he too was proud of his tangerines, did not consider them the best citrus fruits on the face of the earth. Lemons and oranges, and even other fruits were raised in his earldom in addition to tangerines. For this reason people in Tangerinia had a freer life than in the earldoms next door, and they stood out owing to their hospitable disposition. Everyone in Tangerinia was devoted to their kind earl, and he was very proud of this. He, too, however, did not have enough time for his own son. The heir apparent of Tangerinia spent all his time in front of the mirror or at the best-known tailors. Therefore the best thing in the world he liked to do was to get dressed up, and he changed his finery ten times a day. 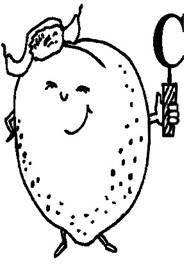 King Citrus the Great had a daughter, a daughter who was beautiful and smart. The king was very concerned about her future. The young heirs apparent to the earldoms all courted the princess in turn, but she rejected all three of them. “What are we going to do, daughter? Where are we going to find a bridegroom for you?” the king asked in frustration. Why were the citizens of Tangerinia happier and livelier than the citizens of the other citrus earldoms? Which citrus fruits do you like best? Why did the princess not want to marry any of the young earls? All three earldoms supplied the king of the CITRUS kingdom with large numbers of their marvellous fruits, which were displayed on tables in the halls of the royal palace and were put on the royal table morning, afternoon, and evening. When no one was in the halls, the fruits talked among themselves, and sometimes they even quarrelled. The LEMON with the thick skin loved to brag. “You've bragged quite enough, brother lemon,” interrupted the golden ORANGE. “Nothing of the sort, my dear, we are sour when we aren't ripe yet. A ripe lemon has a delicate, pleasant taste,” countered the offended LEMON. “That's enough quarrelling,” a ringing voice suddenly interrupted the disputants. The fruits looked around in amazement, but they could not discover who spoke these words. “Even us?” asked the modest TANGERINES, which never joined in the quarrel. 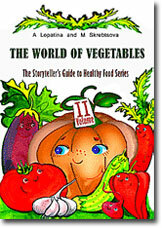 There were the fragments from the book "The World of Fruits".